Rate this Article Usually, when one hears the name Carl Zeiss, quality optics come to mind. This is perhaps what prompted Zeiss to join various companies like Oculus on the VR bandwagon. Find out more! Usually, when one hears the name Carl Zeiss, quality optics come to mind. The company manufactures lenses that are used all over the world from cameras to telescopes with a wide range of applications from scientific to military. With the emergence of VR gear and headsets, Carl Zeiss lenses have once again found its way to a new form of application. Not content with just merely supplying quality lenses to a host of VR headgear makers, Carl Zeiss has embarked on releasing a VR headset of its own aptly named the Zeiss VR One. The VR One is another product aimed at the mobile VR arena. Designed for both VR and AR (Augmented Reality), the headset is unique in that the visor is a tinted transparent piece of durable plastic. The headset uses a custom tray that holds and slides the smartphone in place and has a specific hole for the phones camera to see right through the transparent visor. This enables the camera to be used for specific apps and those that use Augmented Reality. Unfortunately, the phone tray currently uses a custom design that only supports specific phones like the Samsung Galaxy S5 and 6 and the IPhone 6. Also, you have to purchase it separately as the custom trays for the phone models may not be interchangeable with each other though the headset supports display sizes between 4.7 and 5.2 inches in general. Made out of light and durable plastic, the headset is ergonomically designed and comfortable to wear with adjustable straps (both horizontal and vertical) to ensure a tight but comfortable fit regardless the size of the user’s head. The nose cavity is wide enough so as not too cause pressure and irritation. However, since the headset was designed as a one-size-fits-all, some people may experience disorientation when looking downward since they may be able to see the real world seeping through the wide cavity mold. The headset has an FOV (field of view) of 100 degrees and was designed so that the distance of the lenses to your eyes remain fixed and need not be adjusted. Vents at the bottom have been provided for air circulation and both a headphone port and a charger port for the phone have been built onto the side. Also, the headset can accommodate users who wear glasses. 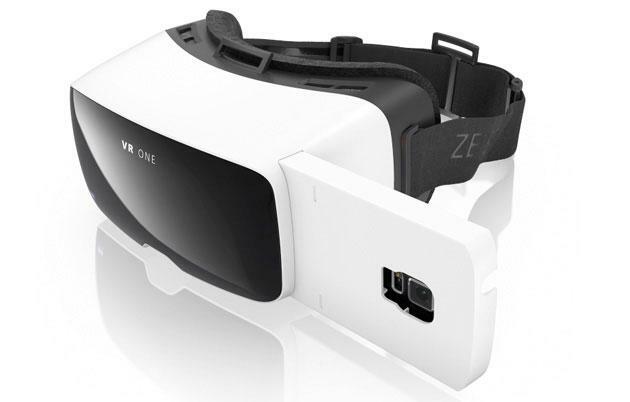 The VR One is compatible with both IOS and Android operating systems and will run almost all Google VR Apps as it was designed as a more durable alternative to the aging Google Cardboard. Again, just like most other mobile VR headsets, the VR One lacks buttons to access phone controls so the user will have to rely on a separate Bluetooth controller to get the job done. Aside from the Google apps, the VR One has a small selection of apps made specifically for it. They can be downloaded from Google Play or the Apps Store and you can visit the company’s website for more information regarding this. They are the Virtual One Media App that acts as a central hub to access/download VR content compatible with the VR One. The Carl Zeiss VR/Exposition app that takes you on a virtual tour of an art gallery where the works of two artists are on display. The VR One Cinema that lets you download video and other content for a VR experience. The VR One however has an Augmented Reality (AR) app that presents great potential as far as combining both VR and AR is concerned. As mentioned, the phones camera can see right through the headset’s visor so the user can view the real world. Augmented Reality is the process of adding a layer of digital information on top of the physical world around us. Just like the movie Robocop where Murphy could see the real world and his diagnostic information at the same time. The VR One has an AR app that uses a colorfully printed cardboard cube that comes packed with the headset. The AR app uses the phone camera to see the cube (in actual reality) and use it as sort of a fiduciary marker so that virtual images can be projected with respect to the cube as augmented reality information. In short, you end up seeing a Lilliputian dancing babe on top of the box. Turn the box around and other images start to pop up out of nowhere like cute little holograms right in front of you. Peep out the headset and all you see is the box, there’s really nothing there since the images are being projected through the app. On a more serious note, the VR One can also work with a drone camera app that can be used for practical applications. The app connects the drone camera to the phone letting the user see what the drone sees. The drone camera can be controlled via the drone’s controller or by simply moving your headset mounted head like an eye reticule mounted on the helmet of an Apache AH64 pilot that moves his gun turret and aims as he turns his head. Sleek! Unfortunately, despite all these, there are still some notable shortcomings observed when using the headset. The VR One definitely has the lens quality and headset durability but some major flaws like being able to adjust the lens-to-eye distance and several misgivings in the ergonomic design call for an updated and improved version of the product. The VR One is priced at around 130$ phone tray included but some retail outlets are selling it for a lot less. Compared to the current selection of VR mobile headsets, it may not hold much of a competition but with the growing popularity of AR mobile games and apps, like Pokemon Go, the VR One is right smack in front. Imagine this guy running around the neighborhood with a VR One stuck to his face shouting at the top of his voice and chasing a running Pikachu that only he can see. That'll definitely be a sight to see!